I’ve been avoiding eating out in Grand Rapids lately. There are a couple of reasons for that. The obvious is I just need to save a little money, so I’ve been eating later lunches, snacking at work, then eating when I get home. The unobvious reason is I’ve just had too many blog posts outside of Southwest Michigan lately. I’ve said all along that this blog is my personal journal, so I’m going to blog about what I want when I want, but I know most people who read it are looking for new places to eat in the Kalamazoo are. Problem is, I’m starting to run out of restaurants in Kalamazoo/Portage and it’s getting harder to eat out with a 4-year-old who really isn’t a fan of sitting still. I made an exception this past week when the BBQ place I’ve heard many people rave about finally extended their hours in to the evening. 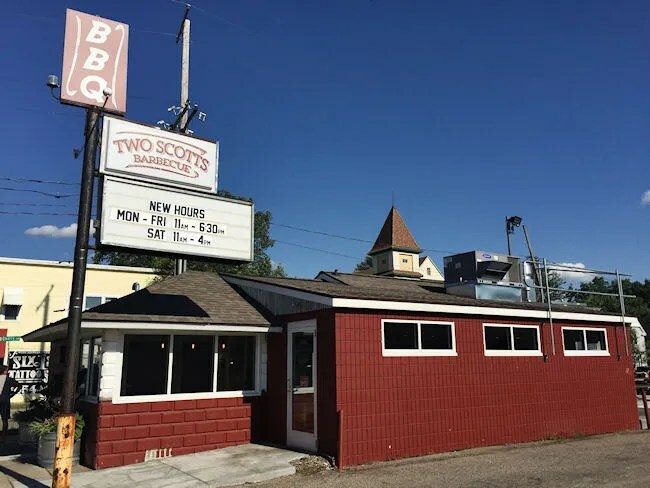 Two Scotts Barbecue opened to much fanfare earlier this year on Leonard Street NW in the old Root Beer Stand. 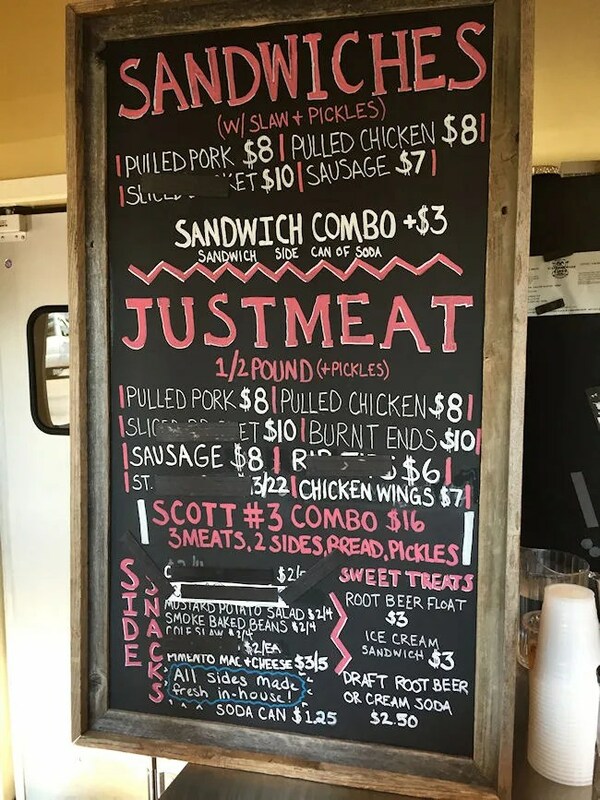 Pretty much everyone I know who has eaten there has raved about it and their BBQ philosophy is right up my alley. Dry rubbed meat over a dependence on sauces. Up until recently, the restaurant closed at 4:00, so there was no chance of me stopping for dinner. 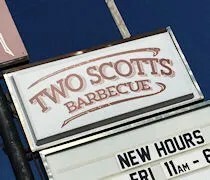 Last week, I noticed they extended their hours until 6:30 during the week and the first opportunity I had to sneak away from work, I headed straight to Two Scotts. The small shop is on the corner of Leonard Street NW and Quarry Avenue NW about four blocks west of US-131. There’s a small parking lot next to the building, but I just pulled up to some street parking about a half a block away. It was pretty late in the day when I walked in and like most BBQ joints, when they run out, they run out for the day. That was only disappointing because I was in the mood for brisket and brisket was already gone. The restaurant is pretty small and depends mostly on carry-out, but they have a handful of tables next to the order counter and in a small dining room in the front area of the building. Food is ordered at a large order counter that overlooks the kitchen. As I said, it was close to closing time, so most of the employees were starting to clean up. Close to closing time actually worked to my advantage…more on that in a sec. Since the brisket was gone, I scanned the menu and, to be honest, I wanted everything on the menu. What I ended up selecting was the Burnt Ends with a small side of Pimento Mac & Cheese. The total price was a little over $13 which I paid for with my credit card. It took a little over five minutes for my order to be boxed up in a brown take out box. All orders are presented that way including dine in orders. They have plastic silverware wrapped in thick paper napkins on the counter in addition to small plastic cups and lids for extra sauce to take with you. My plan was to head back to work and make the entire building insanely jealous…and that plan worked pretty well. 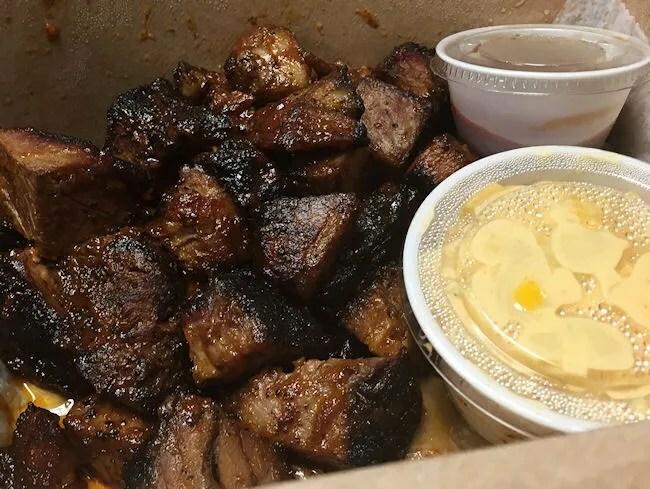 The portion size of the burnt ends was supposed to be a 1/2 lb, but as my box was being handed to me, the person who grabbed it from the kitchen remarked that it was my lucky day because the cook clearly over did it. 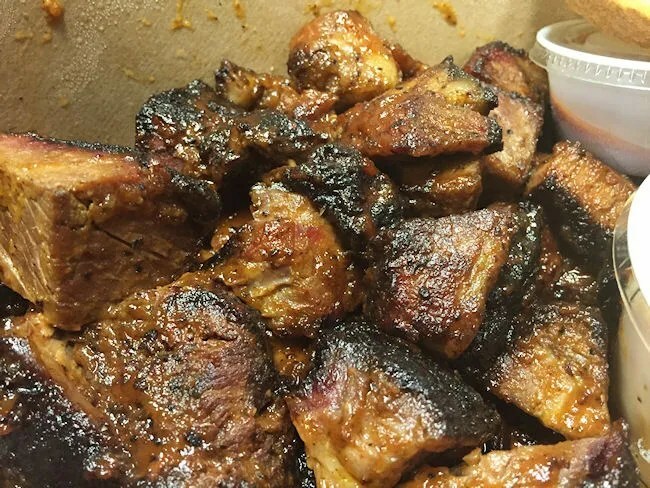 There was much more than a half a pound of burnt ends In the box. In fact, it was probably more than a pound. The small points of brisket were super tender. I’m not sure I’ve ever had burnt ends that were actually that tender. They’re usually a little tough because they can be tough to cook due to the longer cooking time needed. They didn’t really have that really good char that burnt ends usually do, but I didn’t even care. This brisket was so tender and so flavorful. They were tossed in just a little of what I assume is the house BBQ sauce. The Pimento Mac & Cheese was the perfect side for this BBQ feast. 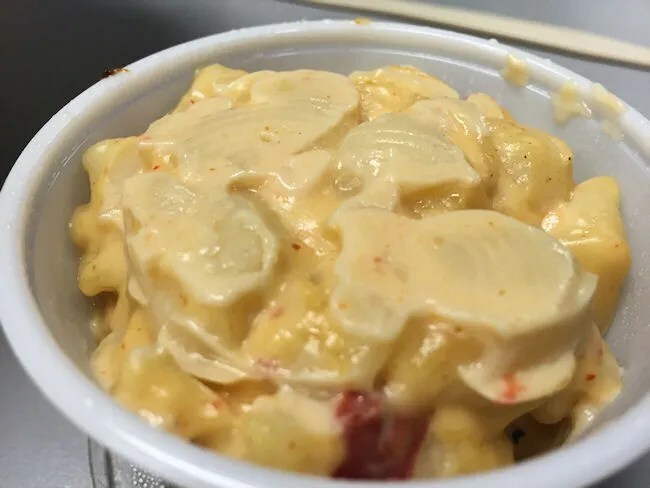 It was very creamy and bursting with the Pimento cheese flavor. I just ordered the smaller portion, but really wanted to keep eating when the little container was empty. Holy crap is Two Scotts delicious. The best thing I can say about this place is that they do BBQ the way I would do it if I ever did it commercially. All the meat is slow smoked on site and the sides are made from scratch. This place is delicious. I mean, delicious doesn’t even begin to describe it.